A soft color palette, ornate details and the charm of vintage patina characterize this Shabby Chic space. Photo by Amy Neunsinger for My Floral Affair/ by CICO Books. Throughout my many moves and whether my home is large or small, my formula for decorating a bedroom remains the same: It must be a place to inspire peace of mind. Selecting the right palette for the bedroom is important because it should feel like a sanctuary. It is where we have our first thoughts of the day and our last. I believe the simpler the room the more peaceful it is. A limited color palette, like this romantic space with deep, dusty purples and pinks, inspires a relaxing mood. I consider all five senses and don’t get too hung up on a bedroom being neat and tidy. I rarely make my bed, but my bedding is always so abundant and sumptuously soft that methodically turning back the duvet and sheets and fluffing up the pillows makes the bed look heavenly. Here are my favorite tips for a romantic bedroom design. 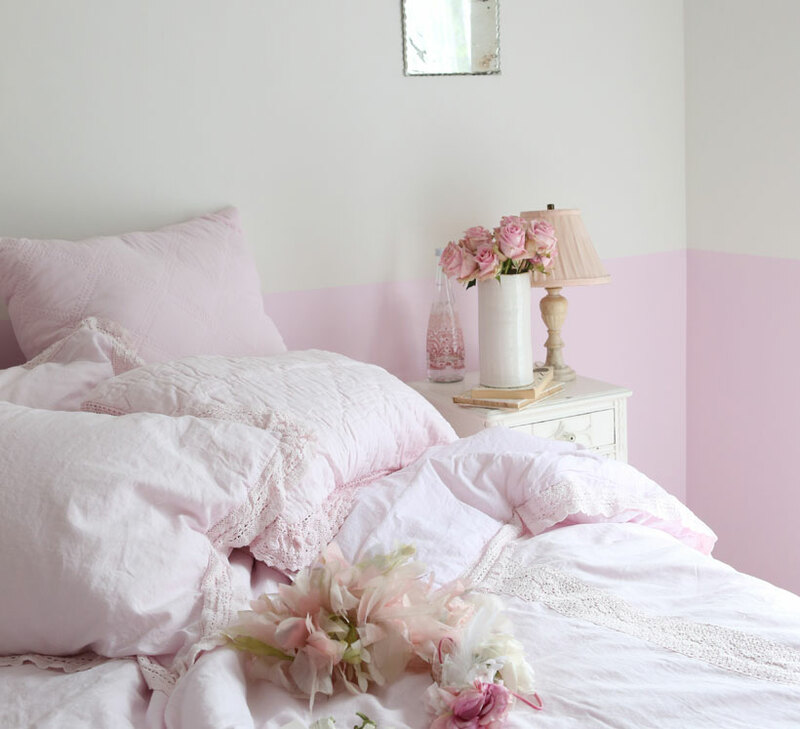 Rachel painted a 36″ portion of this room’s walls in a bright and fresh shade of pink. This trick adds color and anchors the space while keeping a fresh and open feel. Character: I love white bedrooms, or sometimes ivory. Although for fun, I often paint a wall 36 inches from the ground up. This is easily done by marking off the area with blue tape and painting carefully below. 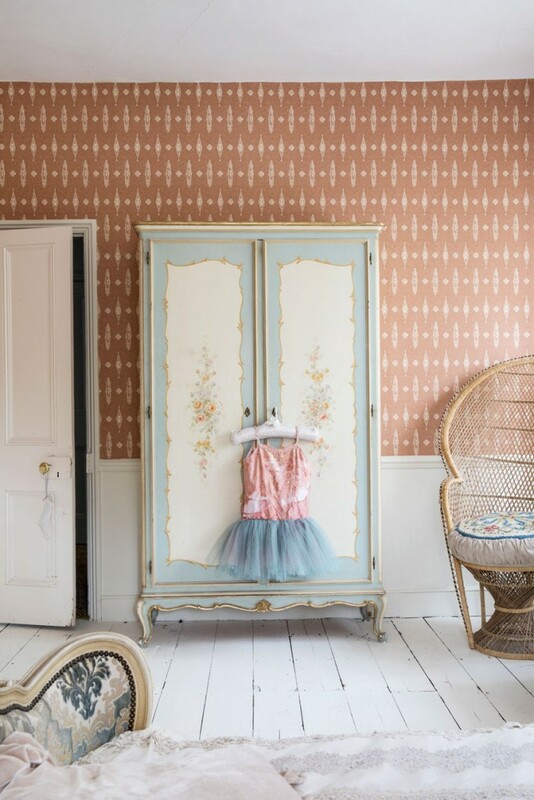 I also love to add a little bit of vintage wallpaper for understated charm. Details matter in small spaces. 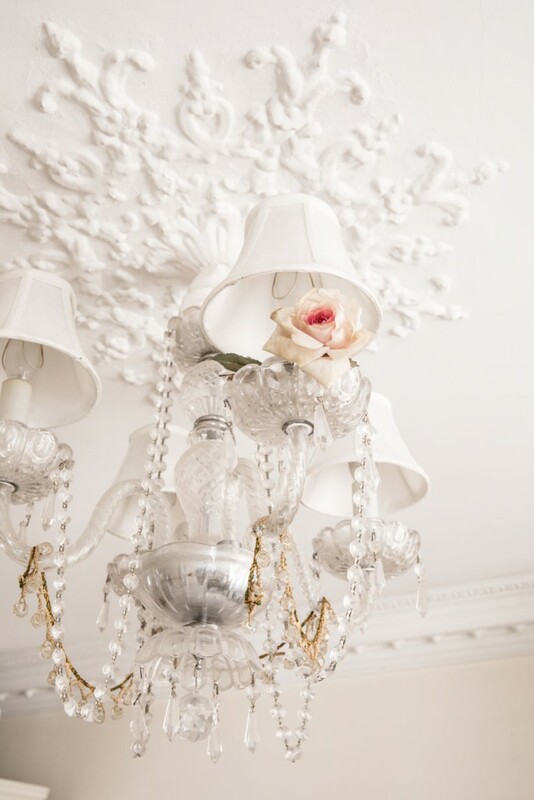 A singular rose tucked into the chandelier is a whimsical touch to catch your eye. Photo by Amy Neunsinger for My Floral Affair/ by CICO Books. Glamour: Always wanting to honor romance, however small the room, I usually add a twinkly chandelier, with lighting on a dimmer to accommodate the function and the mood. Then I’ll add pretty lamps, which don’t have to match, to enhance the coziness. Mirrors are perfect for displaying in small spaces because reflections can create the illusion of extra space. Choose a vintage mirror with a carved frame for extra character. 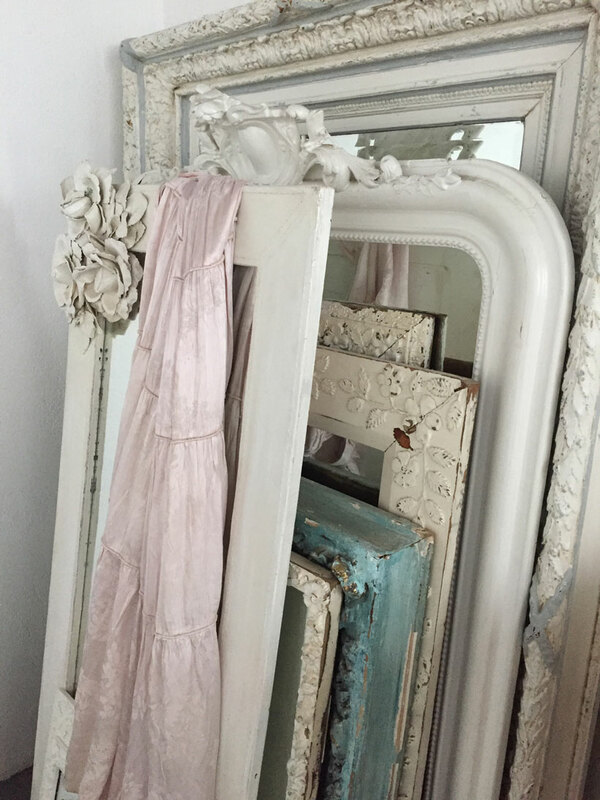 Vintage mirrors: I have an ongoing collection of carved vintage mirrors. Especially in a small space, these are helpful not just for decoration but also for practical purposes, to reflect light and make the room feel a little larger. Rugs add both color and coziness to a bedroom. 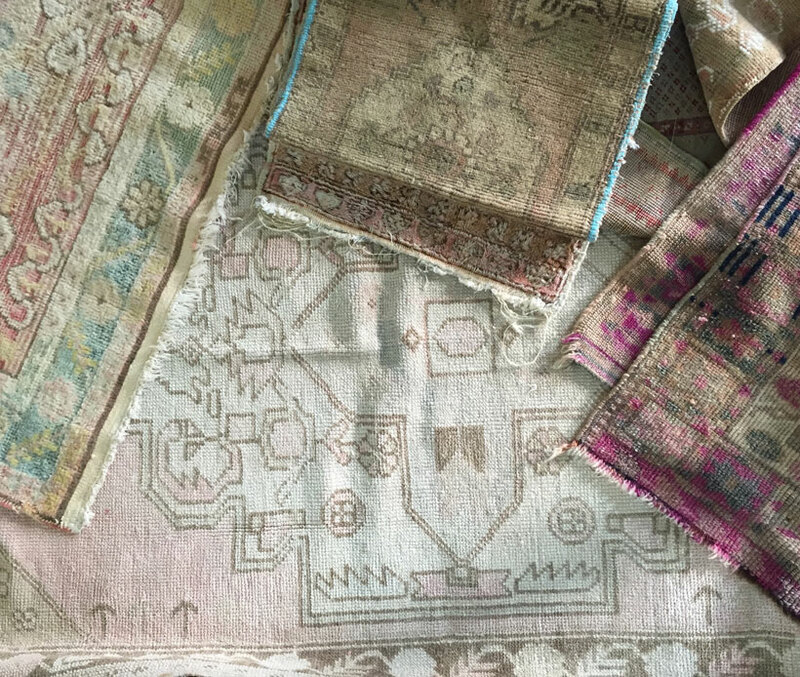 See more of Rachel Ashwell’s Shabby Chic rugs here. Rugs: I have quite the collection of vintage rugs. If a floor is tile or wood, I much prefer to use several small rugs versus one big one. Partly because they are easier to take out and clean, but I also like the eclectic aesthetic. And they tend to be more affordable than larger rugs. 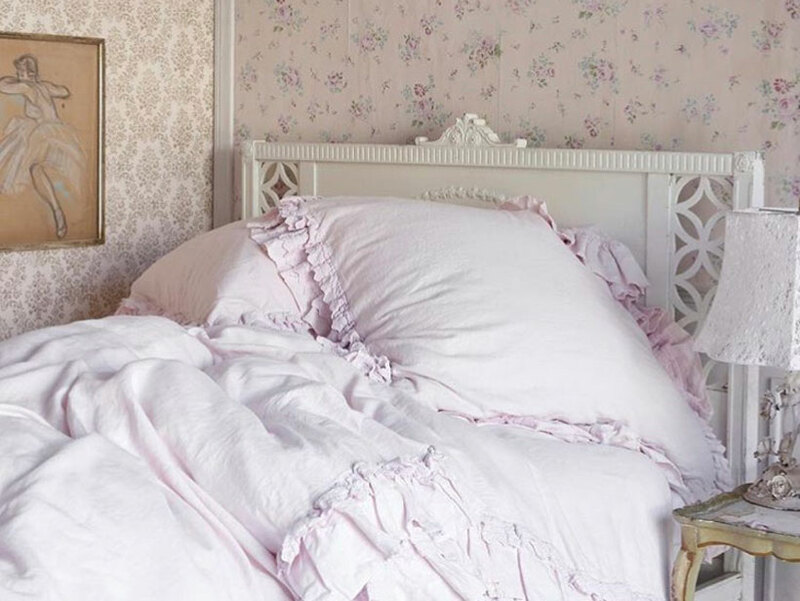 Soft sheets are an absolute necessity in any bedroom, but ruffles and a rosy hue are perfect for this Shabby Chic space. Photo by Sarah Pankow. Headboard: A must for me, a headboard can be upholstered, although for practical purposes I prefer a slipcover. I’m always on the lookout for old architecture pieces that can serve as headboards. They can be subtle but so effective. Rachel Ashwell’s style blends bohemian elements like the rattan peacock chair with traditional style (see the wainscoting) for a look that is whimsical and feminine. Photo by Amy Neunsinger for My Floral Affair/ by CICO Books. Storage: If you don’t have built-in closets, a carved or prettily painted armoire, which you can easily find at flea markets, can set the tone of the room. Choose a fresh and fruity fragrance for an open atmosphere, or a spiced scent for a cozier mood. Ambience: Subtle fragrance is a must. 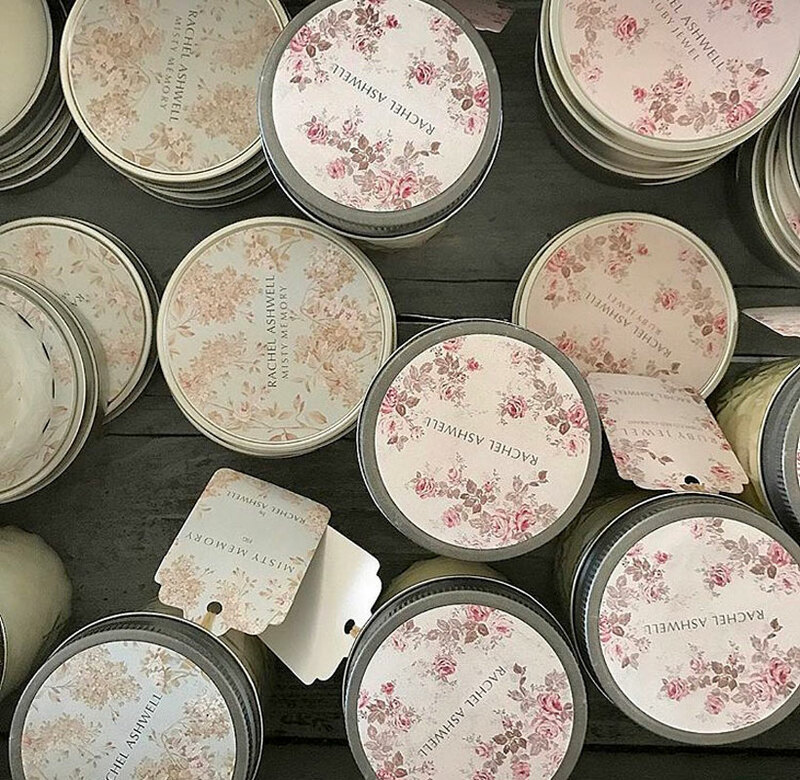 I have a Royal Academy collection of candles that are diverse in nature but a lovely accent. I’m drawn to the subtle scents of vanilla, fig and gardenia. The fragrance of fresh flowers, especially roses from my garden, is always welcome. Lastly, I love to add the layer of peaceful music into a room. 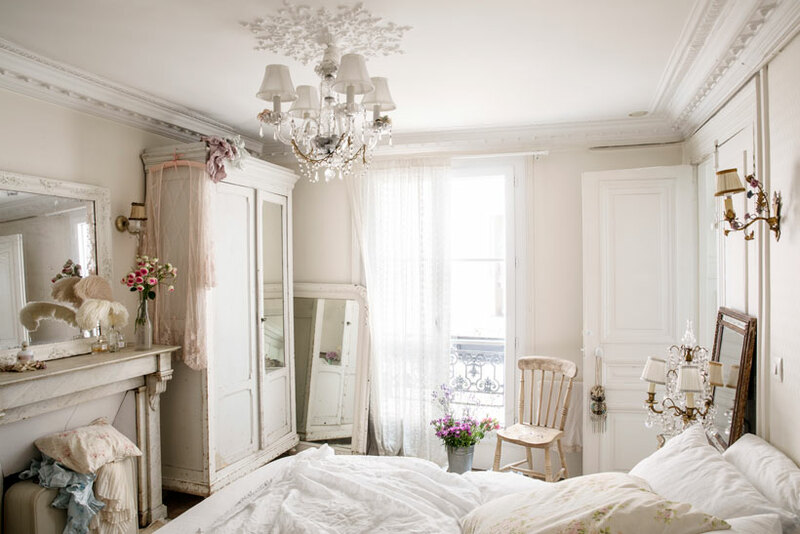 Some soft classical music or Enya would be the perfect layer to complete my perfect cozy bedroom. To create a serene bedroom, find the elements that speak to your senses.